The 8th annual Real Estate Symposium, an exclusive alumni-only educational forum, took place on Tuesday, December 15, 2015 at the Columbia University Club of New York. 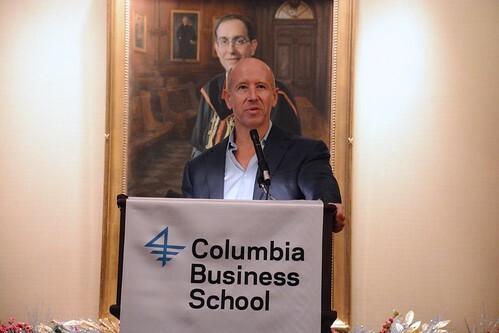 Barry S. Sternlicht, Chairman and CEO of Starwood Capital Group, delivered the opening keynote, and Thomas J. Barrack, Jr., Founder and Executive Chairman of Colony Capital, delivered the closing address. Please see photos from the sold out event here. The date for the 2016 Symposium will be announced this Spring. If you have questions about this event or wish to be added to the Paul Milstein Center mailing list, please contact pmc@gsb.columbia.edu. How Long Can This Real Estate Cycle Last? Cia Buckley Marakovits ’93, Dune Real Estate Partners (chair); Tommy Craig ’82, Hines; Gideon Gil ’00, Cushman & Wakefield; Kate Kerrigan, Columbia Business School; Michael Lehrman ’90, CCRE; Steve McGuire ’11, M&T Bank; Scott Meyer ’14, LeFrak; David Neithercut ’82, Equity Residential; David Sherman ’82, Metropolitan Real Estate. William C. Rudin, Rudin Management Co.